I think I see the fun! Notice the notice for IS Vodka’s cocktail competition. This humble scribe was one of the judges. I’ve been to this show three times, twice as an exhibitor and once, unwittingly, as a judge, reported briefly way down below. Rather than rehash, I will, to paraphrase Inigo Montoya in THE PRINCESS BRIDE, sum up: it was FUN. Now I am back as a publicist, so I am going to get to see the show from the inside out. I’ve already made as much of a fool of myself as is possible to document in previous visits, so I am coming to the show with a combination of humility and sobriety this time around I might not have had on somebody else’s dime. Organizer Steven Wesler clued me into some recent changes in the show that could have applied to people just like me. He moved the show to midweek—at the risk of cutting his audience, as he explained—to raise the caliber of the crowd; in a nutshell, taking a day off from work to come to a drinks convention prevents just anyone from turning up, so they are seeing a lot more bar and restaurant owners, executives, buyers and basically, professionals than ever before. A mocktail competition hosted by Ocean Spray and dating site One2One.com has replaced the cocktail contest I helped judge. Of course, the show still involves drinking at midday so there’s hope for some bonhomie among the delegates and possibly, even some unscheduled shenanigans. Wesler had this to say about the mocktail competition. “One of the hardest things to do when you go out with friends and family is to be a teetotaler. Our mocktail competition is unique and the first of its kind. It allows customers to feel like they are drinking but with no alcoholic side effect. Is it trend? According to The Hero Campaign, designed drivers are looking for more than soda and fruit juice. The mocktail competition will feature many new recipes that quite tasty.” The judges rate the cocktails on taste, appearance, originality, aroma, and overall impression. Participants have only six minutes to make four drinks. I couldn’t drink four drinks in six minutes. The winner walks away with a $1000 prize. On the other end of the spectrum, the show features a pretty stupendous wine and spirits competition. More than 400 entries are vying for titles, as well as Best in Show. In addition to bragging rights, 28 categories of spirits, and white, red, rose, sparkling, fortified and “miscellaneous” wines will gain increased exposure, greater recognition over their competitors and have an opportunity to use their prize in their marketing. Plus, there’s twenty seminars. Experts from across the city and across the world will share their knowledge on all things on-premise from fire safety to craft beers. Finally, the Brazilian Trade Bureau is showcasing all things Brazilian. with ten brands in the show and co-ownership of InBev, the world’s largest beer concern, Brazil has taken a prominent place in the spirits and beverage industry, and they’ve come to showcase their ascendancy. So, there you go. Admission is $45 for show floor exhibits only before June 20 and $55 after June 20 and at the door. 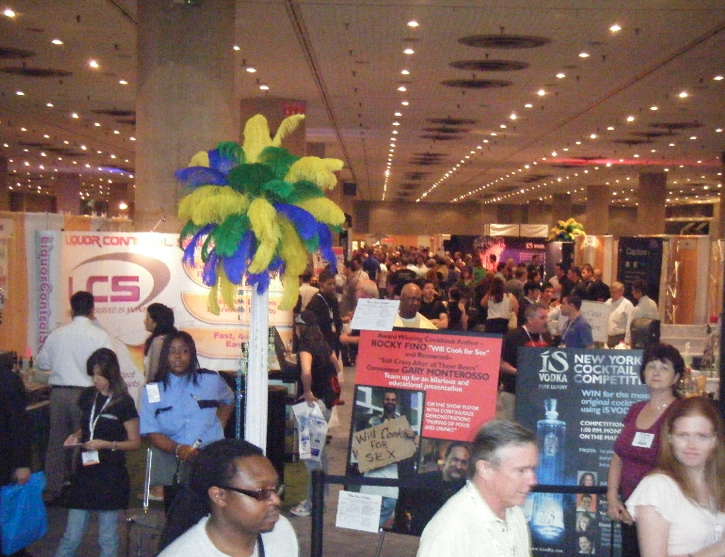 Admission for the seminars PLUS plus show floor exhibits is $150 before June 20 and $175 after June 20 and at the door. Visit http://www.thebarandrestaurantshow.com or call (800)243-9774. You can also find a list of exhibitors, seminars and the whole kitchen sink on the web site.